Heinrich Kleyer was the first entrepreneur to make bicycles and typewriters in Germany. He started out by importing English bicycles, in 1880, and a year later started his own bicycle production. He subsequently established Adler Fahrrad-werke, and introduced both the safety bicycle and pneumatic tyre to Germany. In 1887 the Imperial War Ministry contracted him to supply bicycles and tricycles. He made his first typewriters in 1898, under the name ‘Empire.’ The legendary Adler typewriter was introduced in 1907. In 1907, Karl Friedrich Kührt also started a typewriter company, Kührt and Riegelman GmbH, in Nuremberg, making a machine of his own design called the Norica. After two years, however, the business went bust and Siegfried Bettmann bought it. Bettmann continued to make the Norica, but then managed to acquire the services of one of Germany’s greatest typewriter designers, Paul Grützmann, who designed for Bettmann a new machine, which they launched as the Triumph. 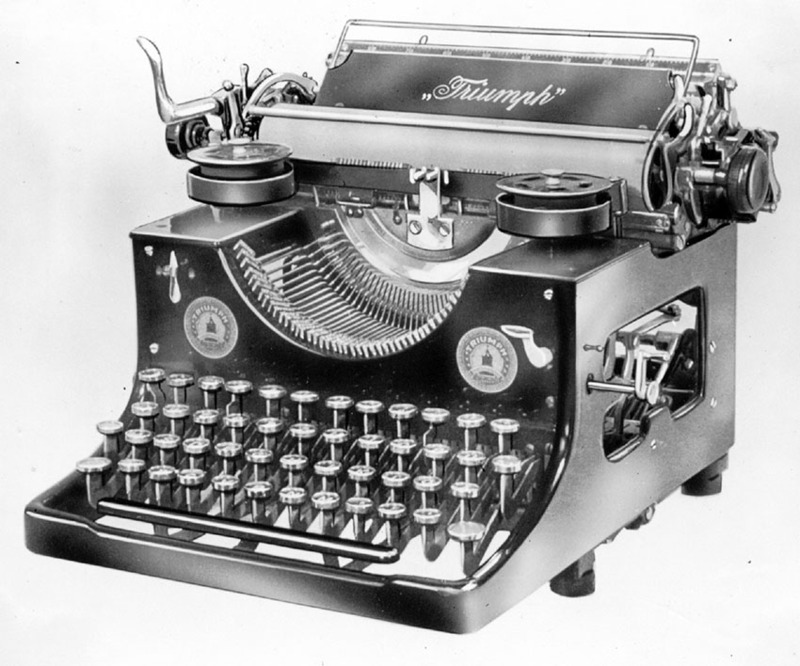 In 1911 Bettmann incorporated his typewriter production into his cycle business ‘Triumph Werke Nürnberg AG’ and started exporting to Russia, Italy and Argentina. In 1913, because of the fear of impending war, the British and German companies became separate entities. After World War I, Triumph continued to prosper. 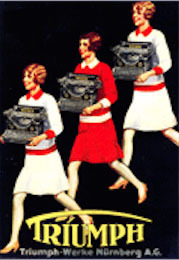 By 1921 it was making 3000 typewriters a year and in 1925 it won a contract with the German Postal Service for 600 typewriters for the sevice’s telegraph division. Oskar Gšrwitz, chief executive of the general agency with negotiated the deal, Horn & Gšrwitz, in Berlin, adapted a Triumph typewriter as a telegraph machine. 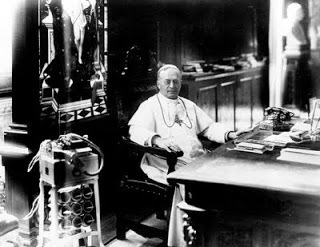 With or without the Pope’s blessing, in 1929, Triumph became the first office machine company in Germany to introduce serial mass production techniques.